Telecanter's Receding Rules: The Potion is Actually . . .
Having the one-page potions doesn't mean I want a boring, standard fantasy world. I mostly just didn't want to miss out on the useful subsystem that has been tested and known to work. 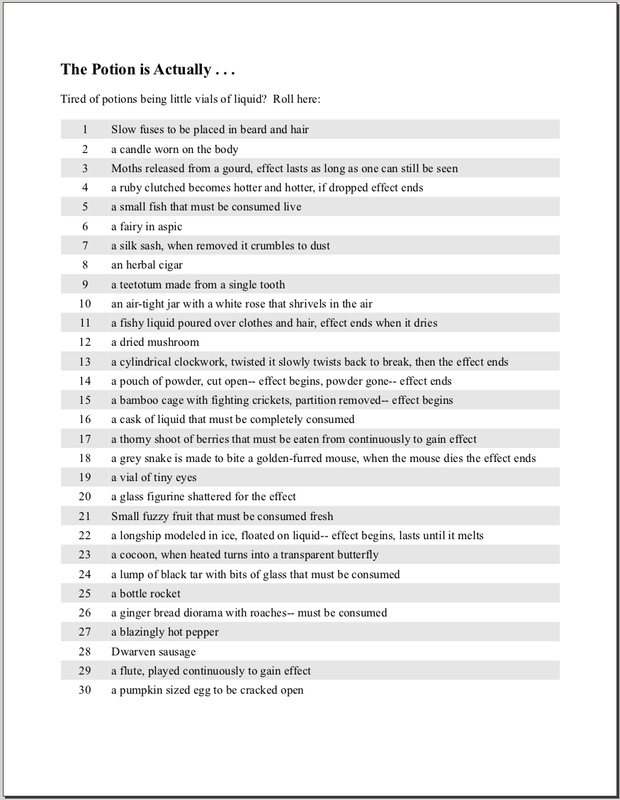 Here's a table to add some spice on top of that potion subsystem. I was riffing on one-shot devices, items that last a limited amount of time, and things you have to consume. That could probably be three charts right there, but it was hard enough to squeeze these out of my tired brain so I'll leave those charts to you. Have a nice weekend. Update: Whoops, I forgot to put an icon to distinguish this from the 400,000 other charts we all use so I added one. Somehow I missed the first chart. Got 'em both now! These would have been very useful last session! This is really inspired, good stuff! One-page basics and the crazy big detailed table ... invincible team-up. Some great stuff I can use here, thanks! 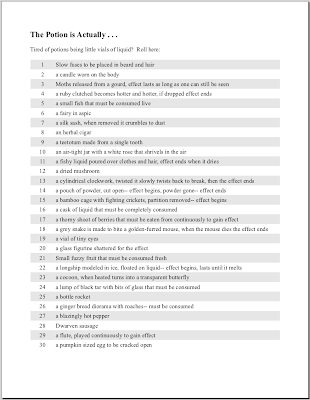 I really like the idea of potions (one-use magic items that anyone can use) that aren't potions (things you drink). But the more envelope ripping, dust sprinkling, bone snapping, candle lighting, stamp licking, and marble polishing we do, the less often we get to say "quaff". A loss for which I will shed a single tear. On the moths - if you can catch one, does that mean you could tie it to a stick, and attach it to your helmet, keeping the effects for as long as it doesn't escape, or at least until you sleep? excellent. I was stuck on things you have to ingest, but you're right - limited duration + people affected opens up all sorts of possibilities. The moths could be a kind of weird grenade - which in turn makes me think of potions you throw over enemies.... good food for thought, as ever. @bliss: I'm glad you might be able to use them, keep an eye out for more coming down the pipe. @Roger: thanks, I am really attracted to both moves-- distilling down to the essence of a thing and then free wheeling brainstorming that pushes to the edge. @heyjames4: alas, quaff is a good one to lose. @richard: thanks. I never thought of it, but, yeah, there could be room for a single-charge, affect-others Gygaxian building block.